Resolution is the number of pixels per inch (ppi). When you enter a resolution figure, you're giving a size to the pixels of your photograph. For example, a resolution of 300 ppi produces small pixels that are perfect for offset printing, if the image is to scale at 100%. If the image is enlarged in your page layout program to 200%, the resulting resolution is now 150 ppi, degrading the image quality. 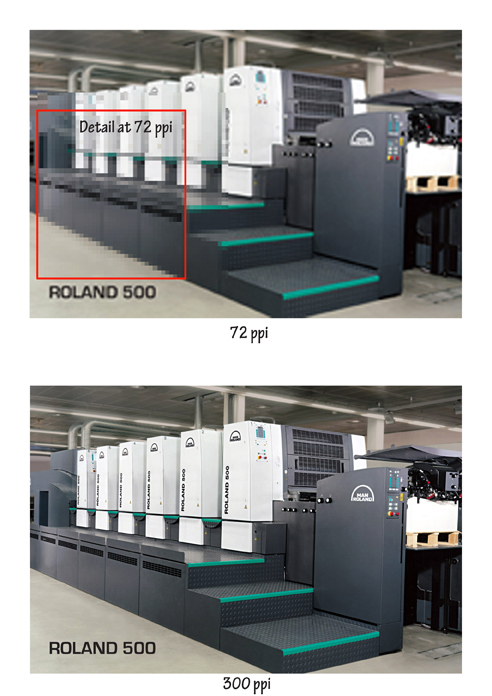 A resolution of 72 ppi produces larger pixels, which will become visible in the printed piece. Solid black and white line art images are best reproduced at 600 ppi. If you enter a resolution that's unnecessarily high, your eyes will not see any improvement in the print, and it will take longer to print.